1. Despite the x-treme value we place on pop culture jackassery, American TV viewers do not seem to know or care about the very x-treme sports of luge or skeleton (a huge loss, when considering how obvious a one-off plot that could be for so many of the current crop of shows about pretty people in the midst of self-destructive quarter-life crises). 2. 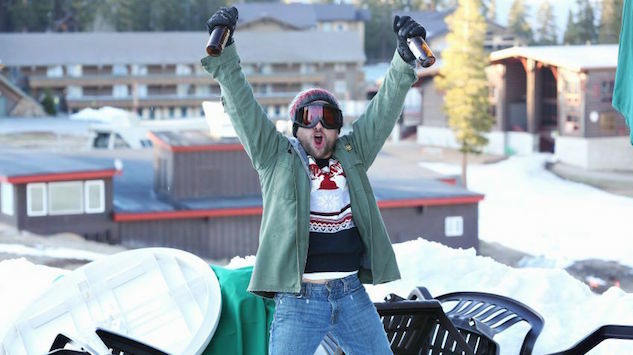 Ski trip episodes, if they even make it up the mountain in the first place (ahem, Friends), are almost universally about romantic adventures to be found in the ski lodge rather than the (un)athletic misadventures to be found on the slopes. 3. Relatedly, most figure skating episodes only exist to give characters a chance to be romantically Machiavellian. 4. Hockey stories are used either as the locus of murderous rage (crime procedurals), or as lowkey ways to drag and/or subvert the grossest excesses of the patriarchy (sitcoms). 5. Bobsleigh does not get the cultural glory John Candy and Doug E. Doug fought so hard to establish 25 years ago. 6. Curling is for nerds. 7. And yet, there are more episodes of television that feature curling than those that feature snowboarding (my working theory is that everyone who cares about snowboarding would rather be out actually shredding powder than sitting home and watching actors pretend to do the same). These lessons spring from a spreadsheet I compiled of 130+ unique representations of winter sports on English-language television ranging from this month’s upcoming 4-episode reality miniseries, Bachelor: Winter Games, all the way back to 1955’s “George Goes Skiing” episode of the classic comedy series Burns and Allen. Ice skating, skiing, and hockey are all heavily represented. Luge has only ever been made the focus of a show once, by Nickelodeon’s Rocket Power. Skiing, what with its built-in elements of isolation and confinement, is the go-to outdoorsy plot device for shows with couples who are facing obstacles both getting together (That 70s Show, Frasier) and still smarting from a breakup (That 70s Show, Friends). It’s not just romances that benefit from the crucible of the slopes, though—family shenanigans (Sabrina, the Teenage Witch), friend drama (Girl Meets World), and murder plots (Murder She Wrote, Miss Fisher’s Murder Mysteries) all thrive up where the air is spare. This two-parter from the first big star of MTV’s scripted Golden Age (RIP) sends Jenna (Ashley Rickards) and her friends on a senior ski trip up and down a real live mountain covered with real live snow for two full episodes, leaving plenty of time for skiing and smooches. It’s a sunny, snowy blast. A classic from black-ish’s first season, this is one of the Ski Trip category’s family crucible episodes. As a bonus, it features a whole snowboard-based Civil Rights Movement subplot, in which Junior learns the meaning of “I Have a Dream” by being discriminated against as a snowboarder. These people are monsters, but they sure have a great time skiing and sending up the hook-up ski party flicks of the 1980s. It’s very bright and gross and fun, and will make you just as very glad the 1980s are over. Where shows use the lodge and/or slopes in ski trip episodes to limit their characters’ (especially romantic) options, they use figure skating episodes to expand them. So much sanctioned touching! So much adorable clumsiness to bond over! So many possibilities of wowing a crush with some sweet ice-bound skills! Again, as with skiing, American television offers lots of options. What is an empty ice rink good for, if not for letting a teen vampire slayer beat off evil demons before kissing the demon face of her ensouled demon boyfriend? NOTHING, is what. Picking up where Buffy’s supernatural angst on ice left off is MTV’s most dude-love-lovin’ comedy horror fest, Teen Wolf (RIP), whose second season banger, “Ice Pick,” filled Beacon Hills’ local rink with A) a cute classic teen ice skate date during which B) our teen wolf hero repeatedly flails skull-first into the ice on which C) a pre-Banshee Lydia Martin (Holland Roden) has her championship-level twirl session interrupted by nightmare visions of D) a dead alpha werewolf uncle trapped beneath her skates. Off the ice, Stiles (Dylan O’Brien) aggressively floats the idea of making out with Scott (Tyler Posey), while Derek’s (Tyler Hoechlin) newly minted Breakfast Club pack gives the dictionary a new definition for “swagger” as they lope around BHHS threatening everyone Scott has ever talked to. Much like Nathan Chen is aiming to take up Todd Eldredge’s 1998 Olympics mantle, “Ice Pick” truly takes Buffy’s 1990s Teen TV legacy to peak 2010s Teen TV levels. Occasionally, an actual Olympian will make a cameo in a TV show’s brush with sports, with Fresh Off the Boat most recently lucking out with a great one this season by Nancy Kerrigan, slyly counterprogramming the I, Tonya moment with a book-signing set during the Kwan-Lipinski showdown. Back in its first first season, during the real-time Kwan-Lipinski showdown, Will & Grace was another sitcom to net an Olympic cameo—theirs in the form of Rudy Galindo, whose performance is the first thing to bond Grace (Debra Messing) and Jack (Sean Hayes) and get them to drop their animosity towards one another as competitors for Will’s (Eric McCormack) friendship. It’s a brief cameo, but a fun one. There is no list about ice skating on television without the wildly beloved anime Yuri!!! On Ice. If you aren’t going to have a slayer and her demon boyfriend, this gay ice skating anime saga is the next best thing. This is an absolute cheat; there are no episodes of television available in the U.S. about actual biathlons, or about bobsleighing, bobsledding, or riding down a snowy mountain in a metal bucket. Top Chef and Bob’s Burgers will have to do! This was an episode late in the ninth season, featuring the four final contestant chefs battling it out on Whistler Mountain in crazy costumes with challenges that had nothing to do with genuine culinary skill. But it’s got stages, like a biathlon, so let’s count it. Spoiler: Bob’s sled is not a bobsled. But it’s nice, clean (kind of) Thanksgiving fun. Weirdly, THIS sport has several television viewing options in the U.S.—especially if what you want to view is educational. There are even episodes of The Simpsons (Season 21, “Boy Meets Curl”) and Murdoch Mysteries (Season 7, “Friday the 13th, 1901) about curling, but neither is available to stream for free. So have these two instead! Curling is completely opaque to me, an American, so I appreciated this deep dive into the meticulous physics of this very northern sport by one of my favorite YouTube educators. I followed it up with some of the suggested videos detailing the creation of the curling stones, themselves, but I’ll let you jump into that rabbit hole yourselves. This is a Canadian sitcom that is in sore need of a laugh track, but which is funny and compellingly anodyne enough on its own to make me wish there was an Office-style reboot of it here in the States. It also made me nostalgic for my hometown rec center, with or without curling bonspiels. Another big category here, especially in the realm of crime procedurals. Hockey invites violence! Who knew! This is the episode where the Doose family reunion threatens to drive Lorelai (Lauren Graham) mad, Jess (Milo Ventimiglia) proves to be a very bad boyfriend who is committed to being constitutionally incapable of making plans with his girlfriend, Lane (Keiko Agena) fakes dating a nice boy her mother found in order to play a long con to date Dave (Adam Brody), Emily (Kelly Bishop) spies her mother-in-law kissing a strange man, and Rory (Alexis Bledel) finds out that Dean (Jared Padalecki) is dating someone new. There is also a hockey game. This is one of the best, most creative, most enthusiastically compassionate shows of the past ten years, and this Hockey Z-9 game is no exception. There’s an abominable zamboni! And more curling! It’s fifteen minutes long; watch it. This show, which I recently discovered in my survey of Verizon’s bizarre free streaming site, is a sports-themed ’90s version of The Goldbergs, and this episode uses the dad’s amateur hockey team to untangle the mess of emotions between the protagonist, a newly-driver’s-permitted son, and his dad. It’s very sweet. Now, Bones has TWO hockey-themed episodes and a lead (David Boreanaz) who can really skate, but this brisk, Bostonian lady-forward take on hockey rage is the more enjoyable of the hockey-themed procedurals currently on streaming offer. What can I say? I prefer a Boreanaz in full vamp. Finally, following the news of the norovirus outbreak amongst Pyeongchang security (and since I don’t have a luge or skeleton episode to offer), take a trip back to Pawnee to convalesce with Leslie Knope. If Leslie can be “a flu-ridden Michael Jordan at the ’97 NBA Finals” despite dying inside, then so can the South Korean officials of the 2018 Olympics. NBC’s coverage of the 2018 Winter Olympic Games starts today, February 8. Go sports!